We appreciate the rugged beauty of nature and believe deeply in the value of conserving our precious areas for future generations. Our mission is to protect shrub-steppe and connect people to this vanishing landscape. The Conservancy owns 2,300 acres and helps manage another 3,000 acres of land in partnership with the Washington State Department of Fish and Wildlife. CCC is dedicated to preserving and restoring the essential features of shrub-steppe and riparian terrain within the Cowiche Creek and Naches River watershed areas. Our lands include the original Cowiche Canyon, the Cowiche Canyon Uplands, Snow Mountain Ranch, and North Fork Cowiche. Our work honors the legacy of agriculture in our valley, which preserved land in the broad open spaces we enjoy today. CCC was established in 1985 and in 1987 acquired the right of way to the abandoned rail line through Cowiche Canyon. 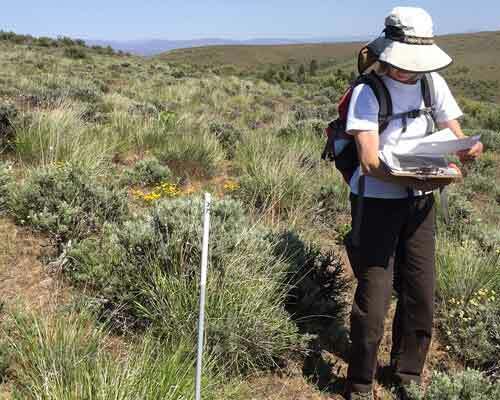 Over the years, CCC has expanded its ownership from the original 100 acres in Cowiche Canyon to more than 2,000 acres of shrub-steppe habitat in the Cowiche Creek watershed. We have more work to do on critical land protection and we are looking at emerging needs for shrub-steppe protection in Central Washington. Conservation is more than acquiring land. We are also actively restoring our lands to bring back native plant and wildlife communities, and doing research to understand the conservation needs of wild species. Follow our work as we deepen our connections with working lands, landowners, and partners to learn about, protect, and restore critical migratory wildlife corridors. 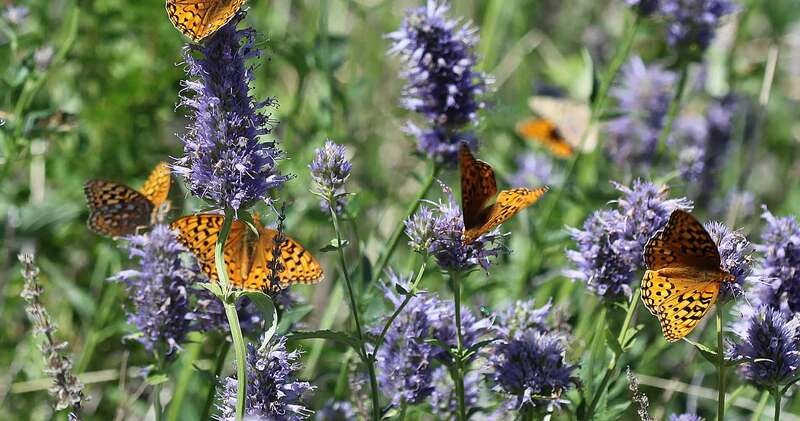 In 2012, Cowiche Canyon Conservancy received a grant from the Yakima Valley Community Foundation to launch Project Butterfly, a citizen science and community outreach program to highlight the astonishing diversity of butterfly species found on our conservation lands. To date, there are over 64 species of butterflies found on CCC lands. This unique array of butterflies was brought to our attention by Dr. David James, a research entomologist with Washington State University. 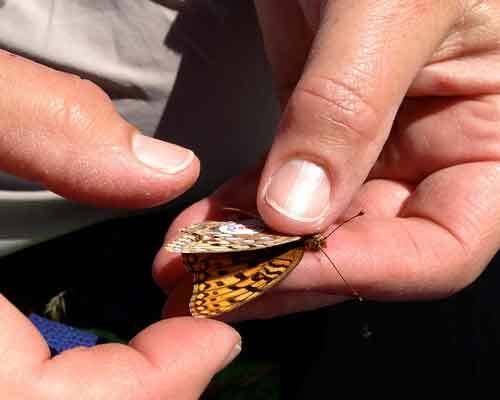 One of the species Dr. James studies is the Coronis Fritillary, a large butterfly that starts and ends its life cycle in the shrub-steppe habitat, and migrates to the mountains in between. Dr. James enlisted our help to conduct a ten-year research project studying the behavior and migratory patterns of this large, showy butterfly, as we have an unusually large breeding population at our Snow Mountain Ranch site. CCC staff and volunteers capture and mark hundreds of butterflies in the spring as they are starting their annual journey to the mountains, hoping to recapture marked individuals returning to the shrub-steppe meadows where they were born to lay eggs and start the cycle over again. 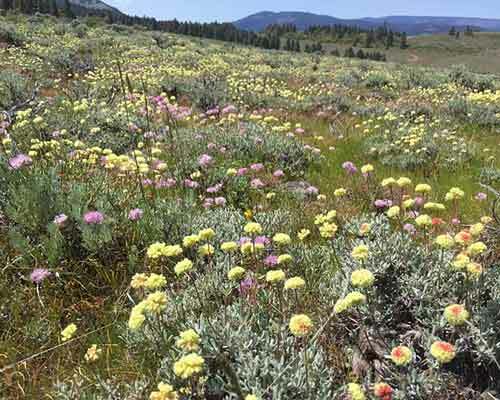 Shrub-steppe habitat in the western United States has been used for well over a century as grazing lands by ranching families. Unlike other forms of intensive irrigated agriculture that convert native habitat into industrial agricultural areas, grazing in shrub-steppe can be managed to conserve the native habitat and coexist with wildlife. We are demonstrating a working lands conservation partnership on nearly 3,000 acres of mixed pine/shrub-steppe habitat in the foothills of the Cascades along the north fork of Cowiche Creek. Conceived of and implemented by the Washington Department of Fish and Wildlife (WDFW), Rocky Mountain Elk Foundation and Cowiche Canyon Conservancy in 2014, the North Fork Cowiche Project was a joint effort for WDFW to purchase the land to add to the adjoining Oak Creek Wildlife Area. The sellers wanted to make sure that their legacy of family ranching could continue on the land, which WDFW could not guarantee. We partnered with WDFW to take the permanent grazing rights in the transaction. We secured a permanent grazing easement deed approved by WDFW, the new owner of the land, that specifies how grazing is to be managed so that wildlife habitat is protected. CCC receives grazing lease payments and returns those payments back to the project in the form of restoration, fencing, and other benefits to the land. CCC monitors the grazing under WDFW’s range science, showing how staff and volunteers from different organizations can each contribute to shared values and outcomes. This project is showing how a traditional working lands legacy, conservation science, and creative partnerships can coalesce to protect land, wildlife, and a rural community value. Our work with Dr. James on the Coronis migratory project led us to working with him on his Western Monarch butterfly conservation research. Each year, Dr. James collects eggs from a large population of Monarchs in eastern Washington that have reached their northernmost summer range. The eggs from these butterflies will become the “migration generation,” who will begin the long journey south to the overwintering colonies in southern California. CCC volunteers are assisting Dr. James in a citizen science project to rear the captive caterpillars in net pens during the month of August, until they hatch out as adults ready to migrate. 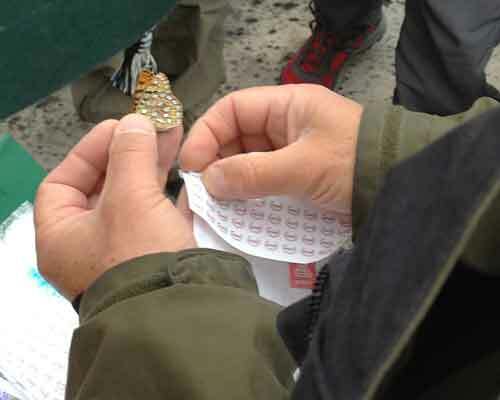 Around twenty dedicated volunteers care for and raise fifteen to twenty-five caterpillars, and mark each adult with a small paper tag with a code number and email address. 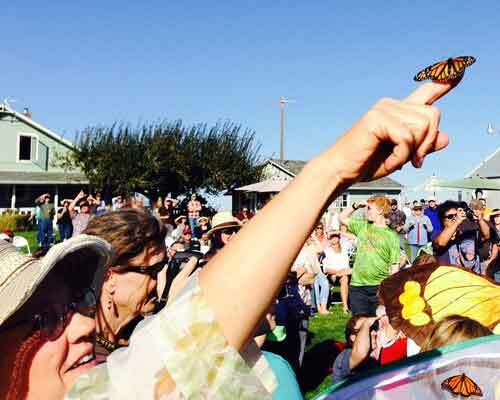 In early September, CCC hosts Music and Monarchs to celebrate the release of the newly hatched and tagged butterflies, as they begin their long flight south where they will spend the winter. The butterflies seek nectar plants along their journey, and take advantage of residential and rural gardens where tagged butterflies are often seen and reported. The captive rearing program is in itself a conservation method, as very few eggs make it to adulthood in the wild. Caterpillars raised to the adult butterfly stage in net pens allows a much larger ratio of success from egg to adult, thus adding to the general population of Western Monarchs which have been greatly reduced over the decades due to habitat loss. One of the biggest threats to Monarchs everywhere is habitat loss. In 2016, CCC received a grant from the U.S. 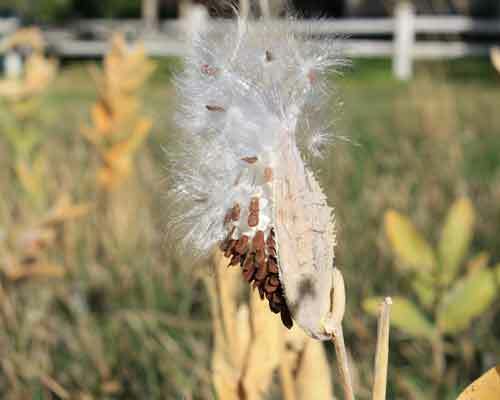 Fish and Wildlife Service to enhance Monarch habitat on our lands by growing milkweed, the host plant Monarchs need to survive. This was a two year project to research best methods for milkweed establishment. 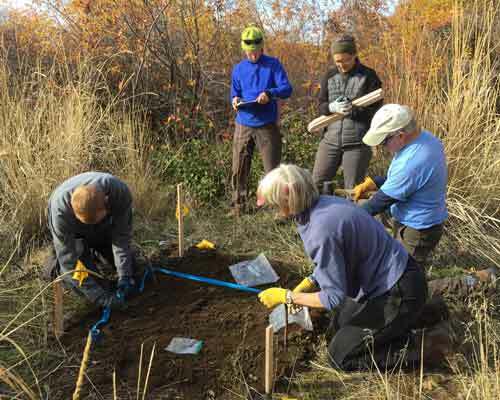 Volunteers planted milkweed seeds and plugs in the fall of 2017 at our Snow Mountain Ranch site. Monitoring our results will help us and others replace lost Monarch habitat.